QUEENSLAND has become the nation’s steroids arrest capital as young men bulk up with drugs bought cheaply online from overseas. Police commissioner Ian Stewart said the use of steroids among youths was “frightening”, and urged schools to be on alert in the wake of a scandal at Nudgee College. 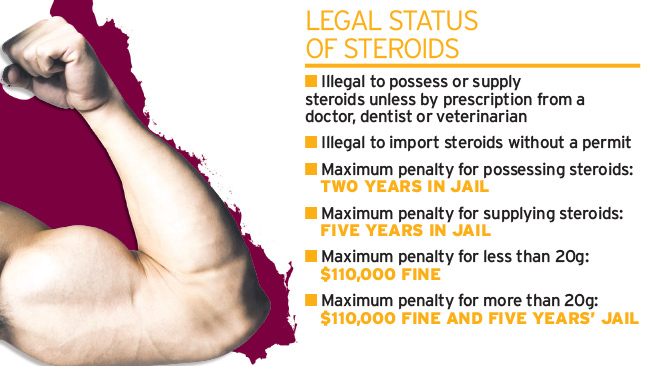 National police figures to be revealed this month will show Queensland leads the country in steroids busts. The number of dealers and users arrested in the state jumped more than a quarter last year. The state’s crime watchdog has warned more and more young people, especially teenage boys, are using steroids and other performance and image enhancing drugs (PIEDs). The Crime and Misconduct Commission report identifies a shift in the use of the drugs from sport and body building to a “desire for particular body images”. Illegal imports of weight loss and tanning drugs have also surged as youths learn how to access and use the drugs through internet chat forums. Drug Squad chief Superintendent Steve Holahan said people who previously had to rely on local sources such as dodgy doctors, pharmacists or even veterinary offices for steroids now simply turned online. “I wouldn’t think that too many people here would be trying to set up massive distribution networks because you can buy the stuff on the internet,” he said. St Joseph’s College, Nudgee was rocked by a steroids bust last week that led police to charge two students and caution another. Supt Holahan said new figures set to be released by the Australian Crime Commission this month would show a 28 per cent rise in Queensland arrests in 2011-12. ACC figures for the previous year showed 231 out of 365 arrests for steroids nationally were in Queensland. Supt Holahan said the steroids market was small compared to other drugs and was largely confined to individual users and niche suppliers to the fitness industry. Border seizures of PIEDs have soared with 8721 detections in 2011-12, a jump of 57 per cent on the previous year (5562 detections) and a rise of more than 700 per cent from six years ago (1090 detections).